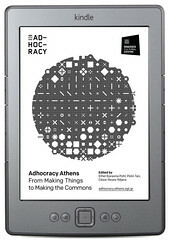 The Adhocracy READER, an e-Book that unfolds the issues that widens up and deepen the theoretical, historical and empirical theme of the exhibition Adhocracy ATHENS. The publication also tries to get rid from the assumption of what a catalog should be. It does not collect or list exhibited projects; but the ideas and texts which have inspired both the curators and practitioners of the selected projects. Adhocracy is a philosophy of action characterized by creative, flexible, purposeful attitude. Unlike bureaucracy and its fixed schemes, Adhocracy is adjustable to different challenges and situations. Adhocracy uses available systems in unimagined ways to face existing problems quickly and efficiently. The Adhocracy READER includes contributions by: Nikos Anastasopoulos, Ethel Baraona Pohl, Hans-Christoph Binswanger, Arindam Dutta, Jesko Fezer, Joseph Grima, Wietske Maas, Hans Ulrich Obrist, Matteo Pasquinelli, Alessandro Petti, César Reyes Nájera, Tino Sehgal, Stavros Stavrides, and Pelin Tan. Adhocracy Athens. From making things to making the commons. DOWNLOAD IT for Kindle, HERE. DOWNLOAD IT for tablets and smartphones, HERE.